 Unclaimed property laws are constantly changing. If you’re not staying on top of the ever-changing legislation, rules & regulations, you’re risking costly fines, penalties, audits, and reputational damage. 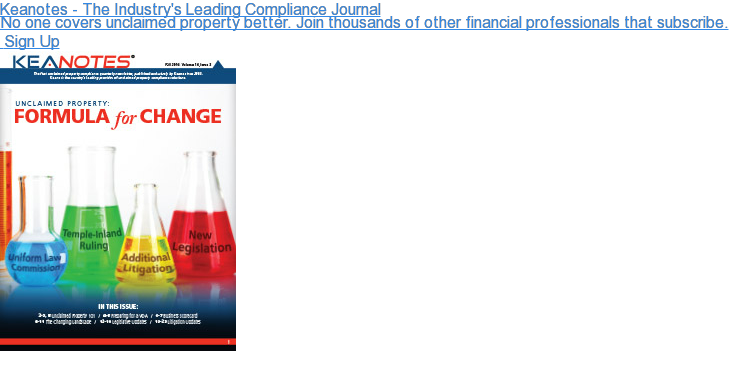 Keane recognizes that maintaining compliance with unclaimed property legislation and keeping up to date in this dynamic environment is a time consuming and highly burdensome task, even for the most seasoned financial services professional. Keane’s compliance update service ensures that organizations are employing and abiding by the most current state escheatment laws. Keane’s Compliance and Legislative Update services are provided on a monthly subscription basis, offering the ultimate toolkit for unclaimed property compliance that can be utilized independently, or bundled together to provide an even more robust compliance solution. The compliance team at Keane continually monitors a variety of sources to identify all legislative, regulatory, and administrative movement affecting escheat compliance. After all new legislation proposed regulations are identified, we determine the overall impact to various industries. 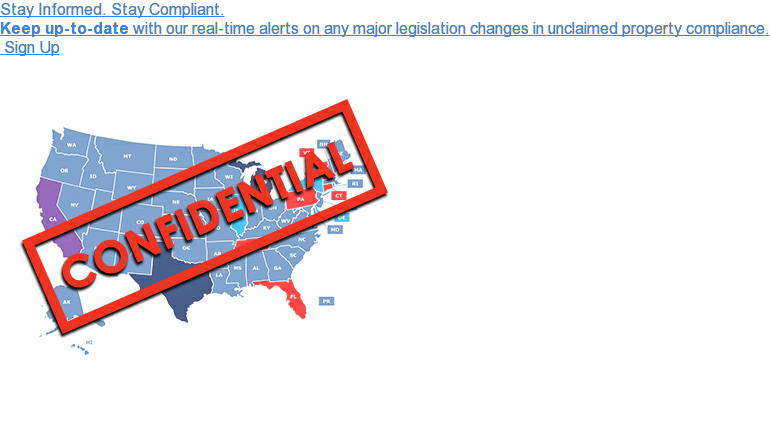 If there are material changes to an industry’s compliance obligations, a legislative alert is distributed providing details on the initiative with an explanation of its scope and timeframe. Various matrices provide valuable educational resource for organizations to review all statutory, regulatory and administrative guidance impacting unclaimed property across all industries and respective property types. Updated at least 60-90 days prior to each escheat reporting cycle, our state reporting profiles provide all necessary details you need to accurately report unclaimed property and remit payment if necessary to all reporting jurisdictions. Keane’s unclaimed property experts can create a custom matrix to provide the escheat information specific to your company, industry, jurisdiction, or particular situation. Sometimes a conversation with one of Keane’s compliance experts can provide the simplest answer to your unclaimed property questions. Our team can help you make sense of sometimes confusing unclaimed property legislation and regulations. Keane’s Compliance Team is led by licensed and practicing attorneys with more than 35 years of experience in the industry, and works in tandem with field specialists that include former state unclaimed property administrators, external auditors, accountants, and financial professionals. This unique insight and perspective allows Keane to offer a comprehensive and cost-effective set of solutions to ensure that your company stays out in front of changes in unclaimed property legislation as they occur. Interested in Keane’s Compliance Update Services? To see how Keane can custom tailor a compliance solution for your organization, please contact us at Questions@KeaneUP.com or call us at 866-848-8896. Protect your company with a personalized audit risk report.